Newly named Arts & Science Dean Brad Rundquist officially takes the position after former dean, Debbie Storrs, was named UND senior vice provost. 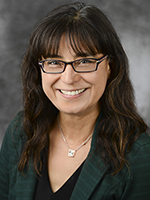 Rundquist has served in an interim capacity since August 2018. 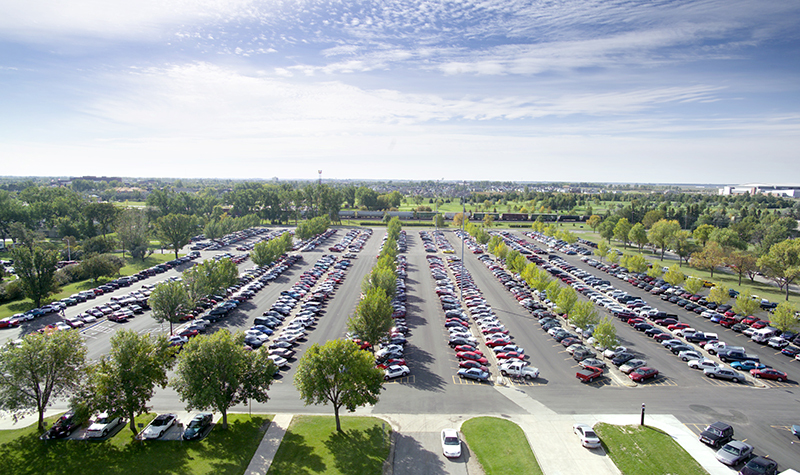 Photo by Jackie Lorentz/UND Today. 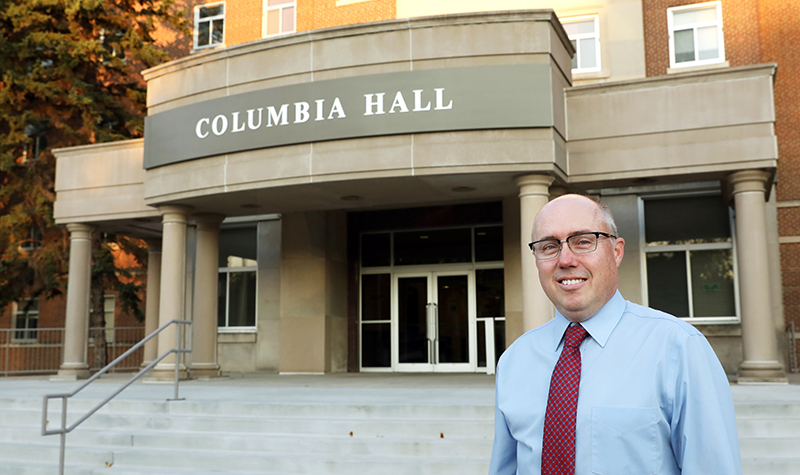 Even as an interim dean of the College of Arts & Sciences, absorbed in short-term objectives, Brad Rundquist harbored bold ideas for the future. Now, he has the chance to pursue them as the newly appointed dean, a position he steps into after technically having done the job since August. 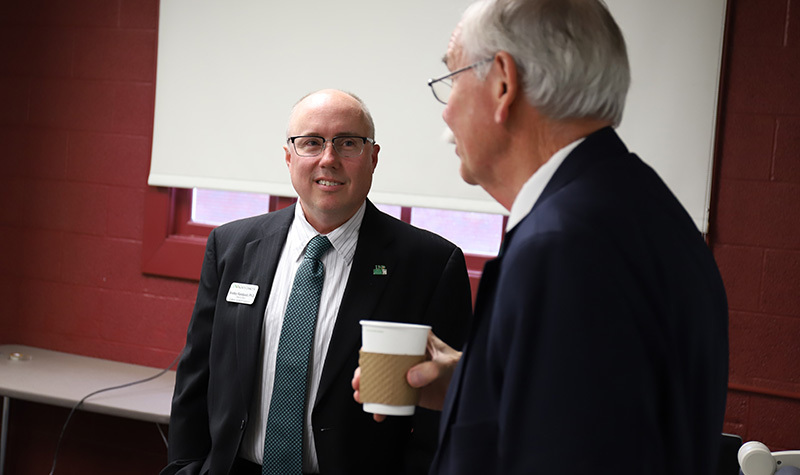 Tasked with meeting administrative, budget and research deadlines in a previously temporary capacity, he gripped the reins of the largest college at the University of North Dakota, when his predecessor, Debbie Storrs, became senior vice provost. All these mold Rundquist’s core goals that he intends to propagate by being a staunch advocate for the college to which he has dedicated nearly 20 years. Rundquist’s philosophy, much like the very origin of higher education, lies in the fundamentals of liberal arts that he aims to elevate as a dean. The knowledge and skills that the College instills – from critical thinking to effective communication to foreign language fluency – are crucial in today’s economy, he said. 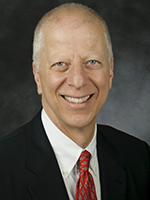 “Those are things that we do quite well in the College and I want to continue to make that point strongly, especially because we see a lot of students coming to the University with an eye on a career and sometimes the realization is not there that they need the skills that we teach in Arts & Sciences to land that job,” Rundquist said. His dedication to liberal arts shapes a career fulcrum appreciated by UND’s top administrators and aligned with the University’s strategic plan. Interdisciplinary has become a sort of a buzz word in academic circles that, nonetheless, is often illusive to truly apply. Not at the College of Arts & Sciences, where a myriad of disciplines come together. 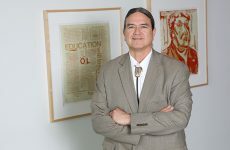 For instance, Rundquist, professor in geography, teaches a course together with Mike Jacobs, former publisher of the Grand Forks Herald, and Karl Bauer, American Indian Studies instructor at UND, that exposes students to disparate facets of North Dakota. The research conducted for class assignments feeds the growing repository of the North Dakota Digital Atlas. Although Rundquist’s teaching load has been reduced due to his growing administrative duties, he hopes to continue to offer that course – not only because of its multi-disciplinary nature but also because of its contribution to the state. Rundquist, Mike Jacobs (right), former publisher of the Grand Forks Herald, and instructor Karl Bauer brought the North Dakota Digital Atlas project to life through their collaborative class. This past fall, the atlas officially launched on the College’s website. Photo by Connor Murphy/UND Today. Serving North Dakota and its people is another tenet of Rundquist’s mission as a dean. “We are already doing a lot of things that are relevant in terms of research and teaching activities to the state,” he said. Take, for example, the wildlife and natural resource management work done by College faculty and students, or the ecological studies, or the examination of social matter, Rundquist said. The list swells to include even his own research that deploys geospatial technologies to challenges such as the overflow of Devils Lake. “We need to strongly continue to share what we are doing with the people [of North Dakota] and there are plenty of opportunities to expand those types of activities,” he said. Rundquist’s vim for UND, the College and North Dakota has flourished since 2000 when he joined the Department of Geography shortly after earning his doctoral degree from Kansas State University. After pre-Ph.D. stretches at a daily newspaper in Iowa, where he served as a reporter and editor, and at Lockheed Martin, where he supported the astronaut photography program at NASA’s Johnson Space Center, Rundquist whetted his academic acumen at UND. Yet, despite his esteem as a researcher and administrator, it is his role as an educator that Rundquist seems to cherish the most. It is a vocation he has inherited from his parents. Rundquist treaded in the footsteps of his dad, a geography professor at the University of Nebraska, Lincoln, where he obtained his undergraduate degree. His mom devoted her career to teaching elementary-school children. “I recognized and valued the importance of education because both of my parents showed me the rewards of being an educator,” he said. That is why, instead of dwelling on prominent papers or managerial milestones – or even his newly assumed deanship – Rundquist said students’ accomplishments fill his deepest well of professional pride.